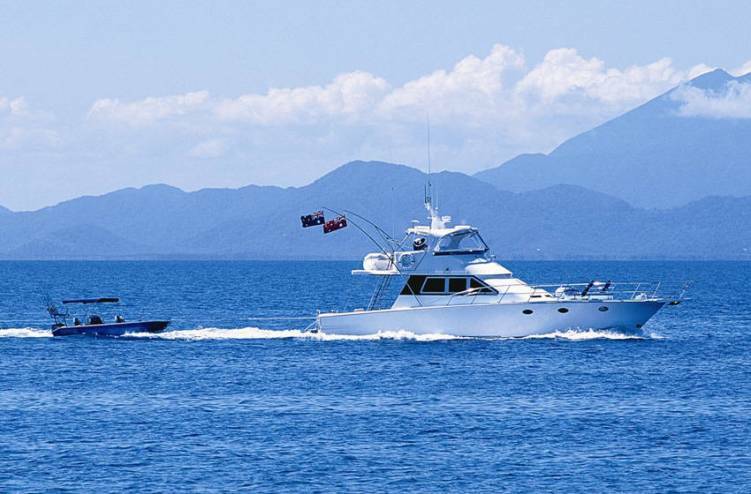 Australia luxury motor yacht PHANTOM is the ultimate private charter vessel and is based in Port Douglas. 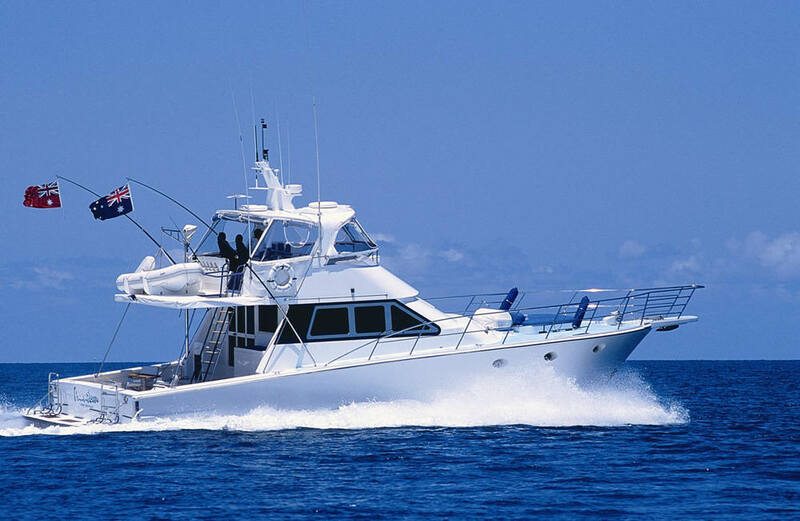 She is the perfect luxury vessel for your getaway to the Australian Queensland Great Barrier Reef. Motor yacht Phantom is a 17.5m PRECISION CRUISER and offers extended charters for up to 8 charter guests in personalized luxury. 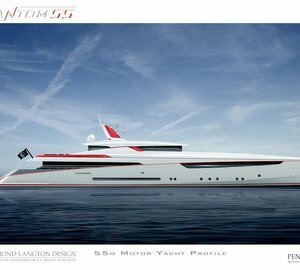 She is also the perfect yacht for fishing, snorkeling & diving, exploring, special events, incentive groups, filming or photography. Imagine spending leisurely days aboard Phantom, on the un-spoilt coral reefs at the edge of the Great Barrier Reef, enjoying a beach BBQ on a Secluded Island, swimming with the Potato Cod at the Cod Hole, Lizard Island, Catching A Reef Fish for the chef to prepare for your dinner. Phantom's Captain and crew will show you the Best the Great Barrier Reef has to offer with all their local experience and knowledge. 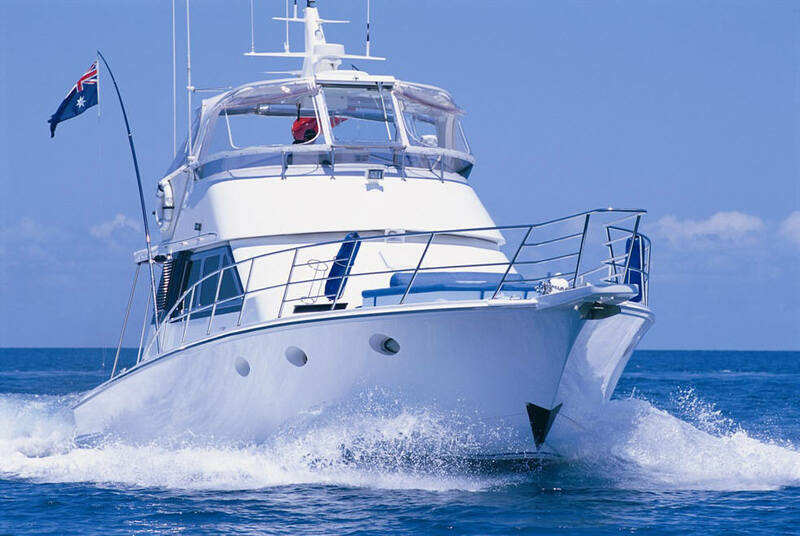 Motor yacht Phantom covers an amazing area specializing in charters throughout the Cape York Region, Lizard Island, and Port Douglas to the Whitsundays. 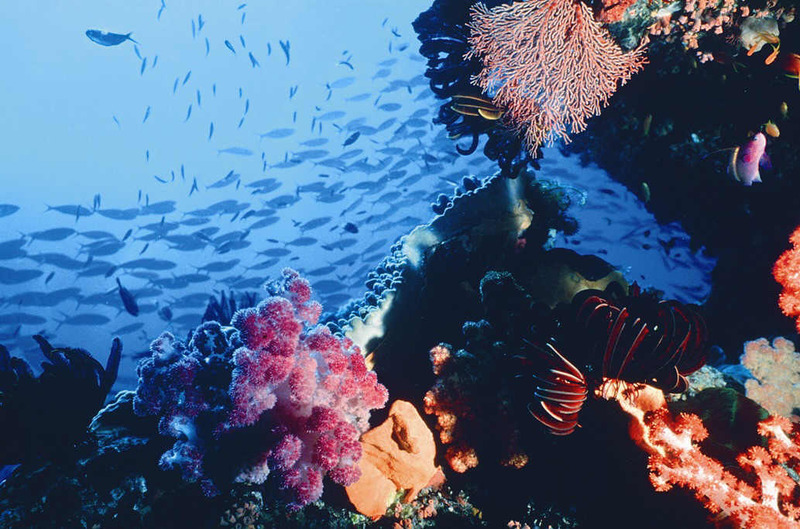 The Great Barrier Reef offers an ideal climate and an array of reefs, islands and coral cays to explore, fish, snorkel & dive. With Phantom’s “Blue Devil fishing tender" you can even explore the remote regions of Cape York and Princess Charlotte Bay estuaries for the elusive Barramundi with PHANTOM as the mother ship. 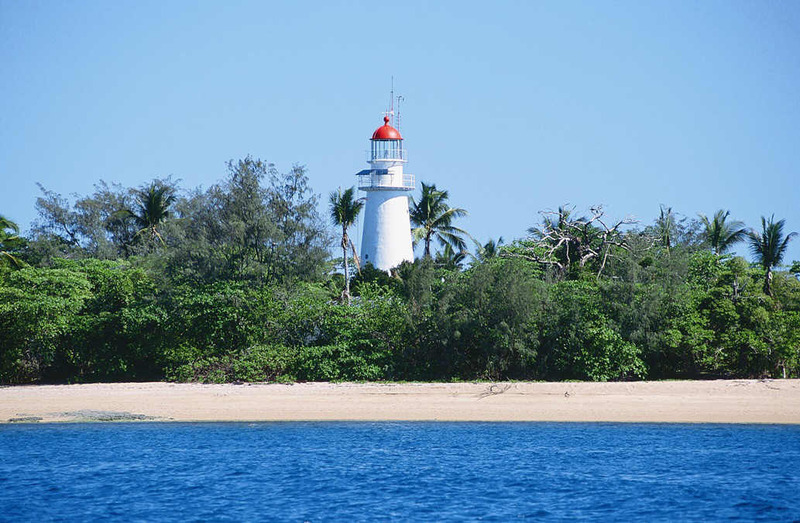 There is also shark watching at Osprey Reef, exploring remote North Queensland waterways such as Lockhardt River and Princess Charlotte Bay or BEACH BBQs at remote secluded islands. You can dive or snorkel and see first hand the spectacular beauty of the reef with its countless varieties of colorful coral and fish species. Try a contest of strength and endurance catching a barramundi. The qualified staff are laways on hand to assist with all snorkeling, diving and fishing expeditions. You can also enjoy fresh local gourmet cuisine, or maybe your catch of the day cooked to perfection. Or try a tailored menu to suit any occasion and dietary need. With a variety of dining areas to choose from, our fully EXECUTIVE CHEF will prepare gourmet cuisine to suit any occasion & dining style. From fine dining to a tropical seafood platter, or coffee & danish, relax in the ambience of Phantom as you cruise the clear waters of Far Northern Queensland. PHANTOM provides a personal, professional service to suit any charter requirement. From the rich & the famous to local travelers who want to see the Great Barrier Reef and the Whitsundays in style. The following are some names, accolades & images of people who have enjoyed Phantom's hospitality. First Lady Mrs. Hilary Clinton - "Thank you so much", Jimmy Barnes, Mimi MacPherson, China's 4th Ranked Leader Chairman Li Ruihuan, Jon Stevens, British Deputy Prime Minister Mr John Prescott - "Wonderful, a dream come true. ", The Corrs - "... a wonderful time" , Pearl Jam, Steve Vizard, Jimmy Connors, Pat Cash, Glenn Wheatley, Sean Penn, James Erskine, Anne Geddes - "Great people, day, great fishing. ", Jean Paul Gaultier, Rebecca Gibney, Jimmy Barnes, Paul "Fatty" Vautin, Kylie Minogue - "Thank you all for a beautiful day. You've made my trip to Port Douglas. Hope to see you again soon. ", John Farnham, Val Kilmer. Luxury Australia motor yacht Phantom provides accommodation for up to 6 charter guests on your tropical getaway: -Main cabin with ensuite -1 Room w/ 2 single beds (bunk style) -1 Room w/ 1 dbl and 2 single beds (bunk style) or 4 single beds (bunk style). 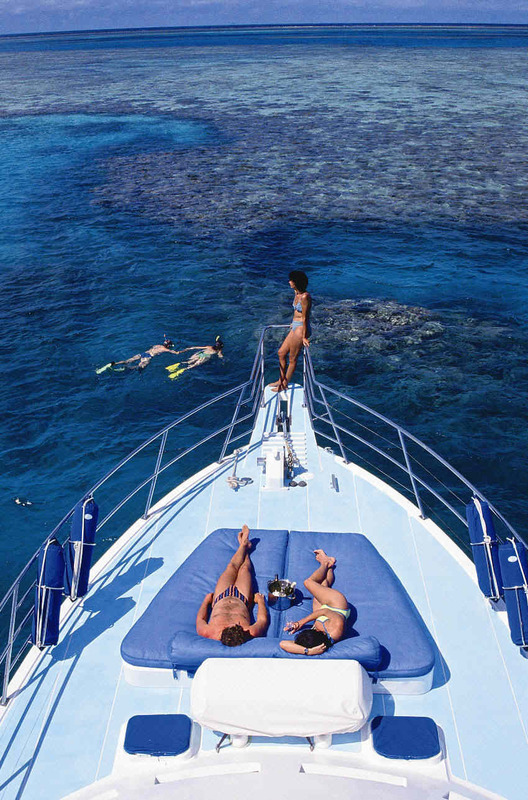 Luxury Australia motor yacht Phantom offers the following charter amenities and extras: DIVING/SNORKELLING A PADI master instructor with over 15 YEARS EXPERIENCE in the local region will show you the magic of snorkeling and scuba diving in the magnificent waters of the Great Barrier Reef. Phantom employs the latest in on board dive technology and equipment, including an on board dive compressor which makes multi dive days available. For those certified divers, or beginners to Scuba Diving, our instructor can introduce you to an exciting new underwater world at a variety of dive sites suitable for all experience levels. FISHING LIGHT TACKLE FISHING is great all year round, providing an assortment of catches from Coral Trout, Mackerel & Sweetlip. With our 6 metre tender, "Blue Devil" (also available for charter), fully equipped with GPS, depth sounder, shade canopy, 2 x 60hp outboards and 2 electric motors, live bait tanks and refrigeration, you can even explore the remote regions of Cape York & Princess Charlotte Bay estuaries for the elusive Barramundi with Phantom as the mother ship. -12 ft tender with 20hp motor -3 snorkelling scooters -Dive Compressor -Icemaker x 2 -Long range fuel tanks -Long range water tanks -Live bait tank x 2 -5 fridges/freezers -Fully air-conditioned - self adjusting in all rooms -Fully equipped galley -TV, surround sound, DVD players-main saloon,stateroom -State of the art instrument console - GPS, radar, sonar -Watermaker - desalinator /unlimited hot & cold water -Satellite phone -Email facilities Equipment: -Scuba diving & snorkelling -Light tackle equipment (Penn 130's) -Outdoor furniture & BBQ.